Recently I made a commitment to write and schedule social media content. In the past, I’ve written books, special reports, articles, and some social media content. It didn’t seem to matter what the project was, the hardest was always just starting and getting into the habit of writing. Writing anything, whether a book or short pieces, means making sure there’s chunks of time set aside to get it done. Recently I joined a Shut Up and Write group. As a result, not only did I get content created, I also completed some other tasks that had been hanging over my head. When the group was over, I wanted more. The idea for Shut Up and Write sprang up in the academic community to help students write their master’s thesis or doctoral dissertation. Students agreed to get together on a regular basis,take a few minutes to get settled in then ‘shut up and write’. They’d start with a 25-minute sprint, break for 5 minutes, then write for another 25-minute sprint. The process turns a drudgery into a social event. 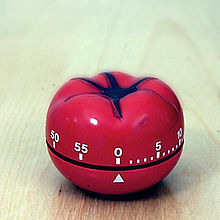 This is called the Pomodoro Technique, invented in the early 90s by Francesco Cirillo. Cirillo named the system “Pomodoro” after the tomato-shaped timer he used to track his work as a student. The process is simple: Any time you’re faced with a large task or series of tasks, break the work short “Pomodoros” spaced out by short breaks. It trains your brain to focus for short periods and helps you stay on top of deadlines or constantly-refilling inboxes. It can even improve your attention span and concentration . This technique of 25 minutes of work and 5 minutes of break is a proven method for working within your brain’s normal rhythms. The added benefits of group support and accountability make Shut Up and Write a win-win. Imagine having time set aside each month when you’ll definitely get some writing done towards your book, blog posts, or other writing projects. This isn’t a replacement for all the time you’ll need to get all your writing project done, but it can be a cornerstone to developing the writing habit. The success I had being part of a Shut Up and Write virtual accountability group, prompted me and 2 of my colleagues, Laurie Wann and Yvonne Gerard, to start a Shut Up and Write group so we could keep the juices and productivity going for ourselves. So we have set up a group for 6 virtual meetings, beginning October 7. We’ll meet via video conferencing. You’ll be sent to Zoom link once you register for the group. Each meeting will be 90 minutes. That allow enough time to do THREE 25-minute sprints of writing. We’ll still have time to share, support, and motivate each other. Our 90-minute video meetings start at 10:00 AM, and run till 11:30 AM pacific. Want to join us and start getting more things done? If you’d like to join Shut Up and Write, click this link to register. P.S. Once you register, please email me and tell me the writing project(s) you’ll be working on. P.P.S I had such success getting my writing (and other projects) done in the group I was in I hope you’ll join me, Laurie, and Yvonne and experience the same kind of success for yourself.